Federal prosecutors in New York and the US Securities and Exchange Commission (SEC) are preparing to file a legal action against Ruth Madoff, wife of jailed fraudster Bernie, amid fears that she will try to flee the United States or move her $70m fortune beyond their reach. Department of Justice sources told the Observer that prosecutors were “working around the clock” to build a criminal complaint against Mrs Madoff in an effort to ask a judge to freeze her bank accounts, which they believe are filled with the proceeds of her husband’s crimes. The SEC, America’s top financial regulator, is understood to be liaising with the US Attorney’s Office for the Southern District of New York to help prepare the asset freezing order. The judge will then decide whether there is sufficient reason to believe Mrs Madoff’s assets were the proceeds of her husband’s $64bn Ponzi scheme. After Madoff confessed his crimes to the FBI on 11 December, the Department of Justice moved quickly to file a criminal complaint against him while the SEC issued an order to freeze his assets. SEC sources indicated that Mrs Madoff would soon experience something similar. 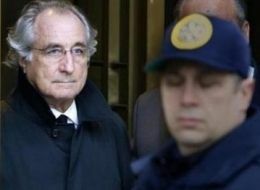 NEW YORK – Bernard Madoff pleaded guilty Thursday to charges that he carried out an epic fraud that robbed investors around the world of billions of dollars, admitting he began operating a giant Ponzi scheme in the early 1990s in response to a recession. “I am actually grateful for this opportunity to publicly comment about my crimes, for which I am deeply sorry and ashamed,” he told U.S. District Judge Denny Chin. He said that he started the fraud but that he believed it would be short and he could extricate himself. The fraud turned a revered money man into an overnight global disgrace whose name became synonymous with the current economic meltdown. Madoff described his crimes after he entered a guilty plea to all 11 counts he was charged with, including fraud, perjury, theft from an employee benefit plan, and two counts of international money laundering. Prosecutors say the disgraced financier, who has spent three months under house arrest in his $7 million in Manhattan penthouse, could face a maximum sentence of 150 years in prison at sentencing. The plea came three months after the FBI claimed Madoff admitted to his sons that his once-revered investment fund was all a big lie — a Ponzi scheme that was in the billions of dollars. Since his arrest in December, the scandal has turned the 70-year-old former Nasdaq chairman into a pariah who has worn a bulletproof vest to court. The scheme evaporated life fortunes, wiped out charities and apparently pushed at least two investors to commit suicide. Victims big and small were swindled by Madoff, from elderly Florida retirees to actors Kevin Bacon and Kyra Sedgwick and Nobel Peace Prize winner Elie Wiesel. Bernard Madoff is set this week to plead guilty to orchestrating a massive Ponzi scheme. But could we be in line for more guilty pleas before this is all over? [T]he [Madoff] investigation … has broadened to include a number of suspected co-conspirators, according to federal officials involved in the case. There are said to be three groups of possible co-conspirators, who could potentially be charged either criminally by the Justice Department, or civilly by the SEC. In the first group are employees of Madoff’s firm who concocted false trades and sent out phony statements to thousands of unsuspecting clients.The second group is comprised of principals in feeder funds such as Cohmad Securities Corp. and Fairfield Greenwich Group, which funneled investor dollars to Madoff and received large fees for steering this business. If they were aware of Madoff’s fraud, they could face criminal charges; if they were not, they could be hit with civil charges for a lack of due diligence. The third group is the target of an investigation that’s still in its early stages into money laundering through British banks, in which US and British authorities are cooperating. This group consists of solicitors, accountants, and others in London who may have assisted Madoff in transferring funds from client accounts to a Madoff entity that lists Ruth Madoff, brother Peter Madoff, and sons Mark and Andrew Madoff among its board members. It’s not clear from any of this that any specific members of Madoff’s family, or his inner circle, are in immediate legal jeopardy. Its report doesn’t go as far as the Daily Beast‘s. The Journal says it’s still unclear whether prosecutors believe these people knew they were involved in a fraudulent scheme, and doesn’t explicitly say that the investigation has broadened beyond Madoff himself. But it’s noticeable that the paper does take the time to lay out what’s known about the possible involvement in the scheme of five of Madoff’s relatives and associates — including his wife Ruth, who has hired her own lawyer, and his brother Peter, who was the chief compliance officer for Madoff’s firm. With Madoff’s guilty plea soon to be safely in the bag, are these reports an indication of where prosecutors are going next? Massachusetts’ top securities regulator said on Wednesday that the wife of accused financial swindler Bernard Madoff took out roughly $15 million from an account managed by Cohmad Securities days before her husband was arrested and charged with securities fraud. Bushies Are Out Of Control, Refuse To Answer Questions..
At a contentious Financial Services Committee hearing today about the failure of the Securities and Exchange Commission to prevent the Bernie Madoff scandal, the SEC’s General Counsel cited executive privilege as reason that he and the SEC’s enforcement branch were refusing to answer congressional inquiries. You can watch the video here – the executive privilege issue comes at about 5 minutes and 15 seconds into the clip. As you’ll see, SEC officials refuse to answer the committee’s basic questions about the Madoff scandal, and the agency’s acting general counsel, Andy Vollmer (a Bush holdover and maxed-out donor to John McCain’s presidential campaign) explicitly cites executive privilege as his legal rationale for refusing to provide basic information to federal lawmakers. Congress has a constitutional obligation to engage in basic fact finding, both in order to legislate reforms at the SEC and to publicly expose how our economy was destroyed by sharks like Madoff. Now, Bush holdovers at the SEC are using executive powers – powers that are now President Obama’s – to prevent Democratic lawmakers from doing their job. A 162-page document containing the full list of people and companies that invested with Bernard Madoff’s firm was released Wednesday in a court filing. The list was compiled by AlixPartners of Dallas, Texas. The list includes anyone who responded to advertisements placed by the trustee overseeing the bankruptcy of the firm. Not every name on the list is necessarily a victim of Mr. Madoff’s reputed $50 billion Ponzi scheme, but the list includes “everyone who might have an interest in the bankruptcy case,” according to a person briefed on the document. The list includes trading partners and other customers that have accounts with the brokerage arm of Mr. Madoff’s firm and the investment management division.